There are many beautiful places that are still considered wilderness within the United States. One of the primary reasons for this is the Wilderness Act of 1964. 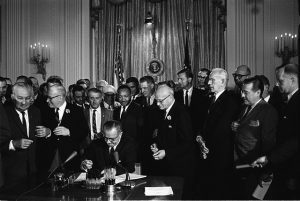 First signed into law by President Lyndon B. Johnson, this law was passed to help protect wilderness areas and preserve them for the American people. The Act defines wilderness and provided federal protection for more almost 2 million acres. Today, the preservation system created by the Act includes almost 110 million acres located across 44 states and Puerto Rico. All land under the Wilderness Act comes from existing federal land. There are several criteria used to determine which land will receive a wilderness designation. These are areas which have a minimal human imprint, present options for unconfined recreation, consist of at least 5,000 acres, and possess scientific, educational or historical value. All areas designated as Wilderness should also have no motorized travel or any enterprises located within the acreage. Any area designated as wilderness will also have a clearly defined boundary which is then set by statutory law. Once the land is designated as wilderness, only another act of Congress can change that. The act of designating land as wilderness is considered the highest level of conservation protection used for federal lands. Designated wilderness lands are managed by four federal agencies. The U.S. Congress has given this responsibility to the Bureau of Land Management, the U.S. Forest Service, the National Park Service and the U.S. Fish and Wildlife Service. The agencies are mandated to manage, preserve and when possible, restore the wilderness areas. Under the Wilderness Act, no commercial enterprises or permanent roads may be created within the wilderness area. The only exceptions to this are recreational or other services that adhere to the tenets of the Wilderness Act. As a rule, a wilderness area will not allow any motor vehicles, motorized equipment, temporary roads, mechanical transport, or permanent installations or structures. The Act does acknowledge there may be exceptions to protect private property, provide for human health and safety, to fight fires, and to control insect infestations. Within National Parks, the backcountry areas may not fall under the Act. Often, these wilderness areas are protected by agency policies which can be changed. When an area is designated as a wilderness area under the Act, it is protected for all Americans, present, and future. The Act also protects watersheds, open space, diverse ecosystems, natural soundscapes, and biodiversity. There is a sense of wildness in these areas which can serve to produce both a physical and spiritual experience. Wilderness areas are often used for outdoor recreation that doesn’t require motorized equipment or vehicles. A more recent interpretation of the Act banned bicycles from the wilderness areas. The Act does allow certain uses including grazing and extracting resources if these were performed before the land was designated as wilderness area. ← What Should You Do If You Are Hurt In The Wild?